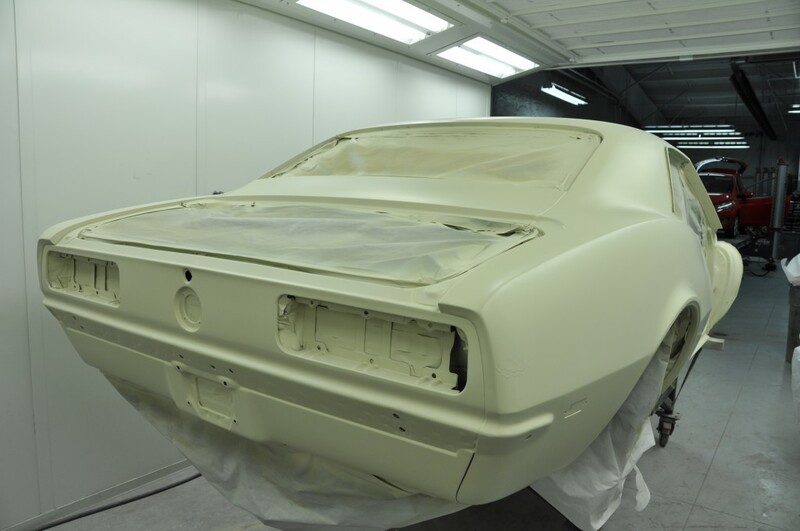 The 1968 Camaro body core has been through metal repair, has been Epoxy sealed and has now been primed after block sanding the sealer. The next step is to block sand the primer to flatten the surface and then re-prime the entire assembly. It will then sit for about a week while waiting for the primer to fully cure while we attend to the bolt on body parts. They will then go through the same process. When they have all been primed, the body will be re-assembled to insure proper alignment and fit of all the body parts on the new sub-frame and radiator support pieces. When we are happy with the fit, the parts will all come back off for final sanding and to have the color applied. The paint will be the original Maroon color in a two stage base coat clear coat process. We will also add the appropriate paint striping during that process to restore its original look.